The Plokta cabal are here, each with our separate laptops, our senses heightened with belly tuna and dulled with sake. We have watched "15 bad pop videos of the '70s", The Two Towers , and Pirates of the Caribbean . I explained to Sue that Zuma (Windows only, and the deluxe trial only lets you play for an hour, so play the web version (also Windows) first) might well be the most addictive video game I've ever played, and we haven't seen her since. We also swapped Christmas presents. The cabal want to have a whip round to get Steven & me a Vicks Baby Vaporizer (via all sorts of people). Steven opened some metal book thingies. "What are those?" I asked. 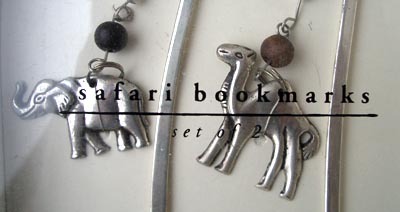 Safari Bookmarks, said the box. Mike got Mr Bean socks, and the Dr Plokta action figure acquired a voice box that makes him squeak like a Clanger. And I set up Samba De Amigo on the Dreamcast. But therein lies another tale. I didn't remember to write about Friday's gig until just now, when I saw Dr Pete had also been there. I'd been planning to go to the Oysterband 25th anniversary concert since first hearing about it; in the event we took our friends Joan Paterson and Tibs, leaving their and our children at home with our beleagured babysitter. The Forum takes about 2000 people, though some of those must have been upstairs in the seats. We were downstairs, just behind the sound desk, pressed up against the wire cage. I'd wanted to go down the front and be trampled to death but I was outvoted by my friends. The front of Oysterband gigs is a bit scary if you're short. Because of the kids, we missed much of the Oyster Ceilidh Band, opening the evening with a proper ceilidh down the front. If I'd been there first thing, I'd have danced, but it was too full to get anywhere near by the time we were there. The proper support was acapella Chumbawamba. Oysterband and Chumbawamba have been pals for a long time, playing on each other's records and both fitting into the loud, anti-establishment traditional music niche. So they were the perfect guests for this concert. Chumbawamba has dozens of mp3s online, including lots of great songs; they also have an entire section of "illegal downloads" -- tracks that they unaccountably forgot to get the rights for but have put on their website anyway. Here's what the Oysters played: Native Son, Uncommercial Song, If you can't be good, be lucky, Lost & Found (the first Oysterband song I ever heard), the Bishop of Chester, Angels of the River, Hal-an-Tow, Molly Bond, Mississippi Summer, Dark Eyed Sailor, White Rabbit (those last three with June Tabor, touring with them for the first time since 1990), By Northern Light, 20th April, Everywhere I go, Tumbledown, Blackwaterside, This is the Voice (with Chumbawamba), When I'm Up, Santiago, Blood Wedding -- then the encores: Shouting End of Life, Put Out the Lights, Bright Morning Star (these last two with everyone), We Could Leave Right Now. The audience was completely full of mad Oyster fans of the sing every word kind (there were a couple of occasions where the band stopped playing completely for some considerable time -- though John Jones didn't have to, as he has in the past, ask the audience if they could stop singing so the band could get on and do the next song.) It was, on the whole, a staggeringly good gig. The band were on the sort of form you'd expect; full of both energy and emotion. There was a good mix of favourites and rarities. The sound was generally good (we were right by the sound desk), though there were a couple of problems. This may well have been the best Oysterband gig I've ever been to, and, hey; they're my favourite live band and I've seen them a good few times (perhaps 20 or so?). As on the last couple of occasions I've seen them, they had James O'Grady on pipes as well as bringing back their 'chick singer', June Tabor, to do songs from Freedom and Rain. What's amazing in that setlist is all the songs they didn't do -- Oxford Girl, Granite Years, Milford Haven, All that Way for This, the Deserter, Love Vigilantes, One Green Hill, Another Quiet Night in England, Here's to You, Polish Plain, Jam Tomorrow, just counting the ones they do pretty often. There's at least a couple of dozen more that I'd have really liked to hear. I didn't take my camera this time, foolish, foolish girl. (I was expecting to be standing in the middle of a scrum; in fact I could happily have steadied the camera on the chickenwire). They were filming the gig, so here's hoping there's a DVD shortly. Between my dance matting and my yoga, standing and dancing for four hours holds no qualms for me any more, though I did sleep well. I have an unaccountable feeling of having written this post before. 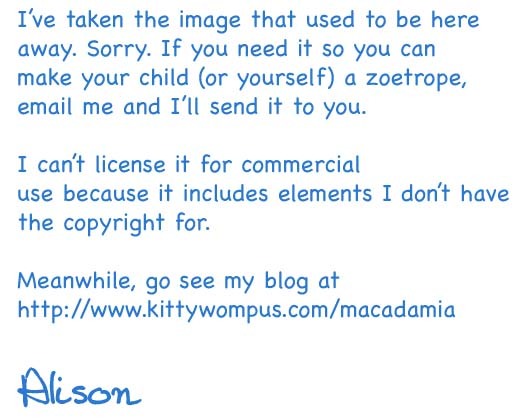 Over at b3ta, they were speculating about the Victorian Interwebnet. The Phantascope and Piano (via) made me laugh like a drain. "Why's that funny?" asked Marianne. Ah. Well, it's complicated... So first I explained about the hamsterdance, and found it to show her. And then I explained about phantascopes, and zoetropes, and found a Build a Zoetrope page where you can print off a zoetrope pattern and stick it together. And then I grabbed the relevant hampster animation, dropped it into Image Ready, and turned it into a zoetrope strip of the right size. Some time later, we put the paper zoetrope under a strong light, gathered round, and spun the zoetrope while all singing that irritating hamsterdance music. And then Marianne understood. Later I produced some more zoetrope strips (a big file, so don't grab it unless you're also making the zoetrope). There's something very theraputic, in a retro way, about grabbing animated .gifs from the Internet and turning them into zoetrope strips. And Marianne took the zoetrope to school the next day for Show & Tell. In one of those weird coincidences that happens, I was reading Teresa's post on Mary Sues, and a comment mentioned Peter's Room by Antonia Forest, a favourite author of mine who I haven't read for some years. Her books tell tales of the Marlow family. Four of them are school stories; these ones were reprinted by Puffin and are relatively easy to get hold of. The rest, apart from two historicals, are set in the holidays, and I have some but not all of them. I wondered vaguely if any the difficult ones were back in print, which led me to the web pages of Girls Gone By Publishers, a small press who specialises in reprinting the impossible to get books in series of school stories. They have negotiated with Faber to reprint all of Antonia Forest's work, and are doing so in reverse order of availability. But when I looked at their list of available books, I discovered that Antonia Forest has just died; her funeral is next Thursday. She was 88; her stories were published over 35 years, during which time the Marlows aged about four years. I guess we'll never know how their story turns out. Meanwhile, Marianne is devouring a very favourite children's book of lots of other people. I didn't read Erik Linklater's The Wind on the Moon when I was a child, but after several friends raved about it recently, I bought a copy. It's not really to my adult taste, but it's clearly a book that would be a favourite if I had read it at the right time. There are a few of these; I sorely regret that I never read I Capture the Castle when I was a misunderstood teenager, for example. Meanwhile, Marianne got home from school in a bit of a funk, stomped into my room to see if there was anything she could break, found The Wind on the Moon and has been reading ever since. Jonathan 'reads' books by following the words with his finger while reciting. After we took Marianne to school this morning, we walked home, and passed a man building a fence, a skip lorry dropping off a skip, and a man painting white lines on the road. Jonathan chased a pigeon, counted house numbers, walked along the top of the wall by the playground, and waited at the railway bridge until a train came. Partway through I started taking photos, and Jonathan's Book is now an exclusive 16-page limited edition. A small joy of the modern age.